It’s the fifth and final week of the #JustWritePH blog tour and I would like to congratulate all the authors who participated and put their work out there. Finishing a piece is an accomplishment in itself, and having the courage to have it read by many is a huge feat, so CONGRATULATIONS! You guys are all winners. Speaking of winners, here’s a sneak peek at the fifth and final #JustWritePH bundle: #ForTheWin. Click the Read More button for story blurbs, excerpts, and author follow links. Hunters – people who exterminate supernatural elements from the world. A certain element, called the Nis, latches on to our main protagonist, Eri Geiju, a stern-looking high school student with a peculiar reputation. This catches the attention of two professional hunters, Eight and Ten and opens her eyes to the true nature of the Hunting business. “Was there anything you did that might have caught this Nis’ attention?” Ten spoke softly. “I don’t remember.” I told the small-framed redhead. Her twin was a different story. I could see her toned arms up close after her hand had rushed beside my face. Eight had brute strength and agility, but Ten was so fragile. Small little thing she was and will remain to be. I followed the two deeper into the forest. “What are you planning to do?” I said as I grabbed Eight by the shoulder. She hesitated for a while then slowly turned towards me. Alexandra Jekyll inherits the Seeker’s Inn but there is a condition. Dearly departed Aunt Emily states that she has to run the inn for a full season in order to keep it. Simple, right? Things get complicated when she arrives to find Aunt Emily’s nephew, Dunstan Draycott, also claiming the inn. Alexandra is determined to keep the inn for herself and for her little sister. She is reluctant to call on her twin, Alexa Hyde, who was showing an interest in Aunt Emily’s nephew, for help. Will Hyde and Jekyll work together or will their rivalry tear the inn and their hearts apart? Alexandra Jekyll read and re-read the letter. Her bright eyes didn’t deceive her. It was a dream. Or more, it was an opportunity. Upon her lap was a letter from faraway Great Aunt Emily stating a possible inheritance. She didn’t even know she had a great aunt let alone any living relative apart from her sister Amanda. It was a will and a condition. Alexandra read the letter one more time to make sure she was reading it correctly. Amidst the rattle of the carriage, she was sure she read it correctly. Greetings, my dear niece! It is unfortunate that I learn of your existence a little too late. When this letter reaches you, I may be no longer in this world. I leave some provisions for you and a condition. Upon Martyr’s Wood Folly is an establishment of mine. It is called the Seeker’s Inn. Run it successfully for a full season and it will be yours. My solicitor will get in touch for further details. I do wish you well in life. Attached with Aunt Emily’s letter were the solicitor’s instructions and a map of the property. “Well, this is an opportunity of a lifetime.” Alexandra said excitedly. How fortunate to have relatives that cared! They have not known about each other yet here was Aunt Emily leaving them an inn! Living in Prestwood Farm has been a blessing for her and Amanda. Amanda, her little sister, was all she had. They were orphans, out in the world without a penny to their name. The Prestwoods were family friends. They took the girls in after the death of their parents. Unfortunately, not much was provided for them. Alexandra hasn’t come out for her season. She was turning twenty-five this year and is considered on the shelf. She had taken nanny jobs and governess positions over the years but she always came back to Prestwood Farm to see Amanda. Amanda will be twelve soon. She’ll be starting a life away from Alexandra, training as a Lady’s companion in a household of a countess. It was better than the work house. Amanda’s life was better than most orphans her age. But it was not what Alexandra hoped for her sister. “Stop fidgeting. You are always saying it’s unbecoming of a lady.” Her little sister scolded her. Amanda was doing some mending. Her fingers were so delicate she could darn socks like she was embroidering. The carriage was rocky but Amanda sewed like she was embroidering in a calm sea. The two of them were on their way to the Seeker’s Inn. “I am not fidgeting!” She said. “Sit up straight, Amanda, please. You’ll ruin your posture, you will. I am just eager to see this inn.” Alexandra said. Amanda was sitting slouched while doing her darning. It became a hobby. She needs another hobby, Alexandra decided. She wanted to put up some money for Amanda. She wanted her sister to have a good marriage, something she couldn’t have. At five and twenty, she was considered on the shelf, a spinster long overdue. If she ran this inn successfully for a season, it would be all hers. She could have a little corner of the world for herself. She’d have income to support Amanda until she could become of age. Eons ago, the world was at an end. However, the days of that nightmarish apocalypse have long since past. Through the combined efforts of the various races, life flourished once again. But when Godfreed Bayani and her service dragon, Ludwig the Steadfast, uncover the remnants of a bygone age, the fate of the progressive land of Celestiano hangs in the balance. When the future meets the past, a duality is revealed and everyone must begin to understand why the world had to make such a drastic change to survive. Godfreed was entranced. Nero was unlike any other dragon she had ever met before. In the post-capitalist land of Celestiano, no one had ever spoken to her this way before. No one had ever enabled her desire to hoard and keep things. Godfreed felt a deeper compulsion awaken within her upon hearing Nero’s words. It grew into an absolute voracity and the sensation overwhelmed her. She found herself unable to say no. She could not refuse Nero and all sense of self restraint, the shreds of which had been carefully cultivated by Ludwig, evaporated. Godfreed was tempted by Nero’s promises of power and greatness. He lured her, saying that she would be enriched beyond her wildest dreams, that the earth’s resources were theirs for the taking simply because they existed and that it was their Manifest Destiny to do so. He thrashed his hefty tail dramatically as he said this, knocking over trees and uprooting nearby shrubbery. Ludwig countered and said it was contrary to the Seven Environmental Commandments as decreed by the High Ethos. He maintained that it would desecrate the lands to act so self-indulgently and that nature should instead be treated with mutual respect and understanding. The two dragons debated by Godfreed, flanking both her sides, with Nero beckoning her to come with him and Ludwig pleading her to stay with him instead. When had they made their arguments, they circled around her, waiting for her to make her choice. Godfreed stood perfectly still, like the mantis she was before taking action. Finally, after what seemed like an eternity had passed, Godfreed answered. And so with a heavy heart but also a calm disposition, Godfreed took off into the sky with Nero, leaving a trail of dark, billowing, clouds of smoke and ash behind. Ludwig wasn’t sure if it was the loss of his master, whom he supported ceaselessly for years, or the remaining miasma of smoke that forced tears to well up in his crystalline eyes. Ludwig was about to slink off and wallow in his misery if not for a female voice that cried out from inside the forgotten mausoleum. Out of the mausoleum tumbled out a small young vampire with bat-like wings. Upon touching the sunlight though, she screamed in agony and her flesh blistered, forcing her back into the safety of the shadows. She cried out for Nero and begged for help. To ascend to the throne is no easy task as many would think and to be a handmaiden caught in the middle of a kingdom-wide scandal, there is no real way to go but to follow what you are told. Follow Helena in her quest to ascend to the throne and find who her real friends are and who may her enemies in the shadows be. Now, here I am comfy in the temporary room assigned to me. Smelling the flowers, I take one gladiola and lie down; putting it beside me. I turn off the lights after. I must have been asleep for half an hour already when I felt like someone was staring at me. I sit up slowly and turn on the lamps beside me. Getting down from the bed, I walk to the windows to check if there was someone outside; No one; only empty darkness beyond. I was about to head to bed when the glass behind me shattered to a million pieces as something solid hit it. Screaming, I covered my head for fear of getting wounded. Turning around, I saw no one but the cold wind moaning. In front of me, I find a pretty large rock—its size could easily fit in the palm of my hand. It’s wrapped in crumpled paper. Nervously, I remove the paper. On it was a message written in black ink. Frightened, I crumple the paper and throw it away. It was then that I noticed what’s carved on the stone. The rock slips from my hand as I move away and press the intercom. “Yes, this is Lady Helena. I’d like to have you check if there’s an intruder in the kingdom. Someone threw a large rock in my room and shattered the glass window at the right side of my bed.” I described in my frantic voice. “I’m in the Emerald Suite, yes, I’ll wait.” With my knees shaking, I sit on the bed as I curl up my legs close to me. 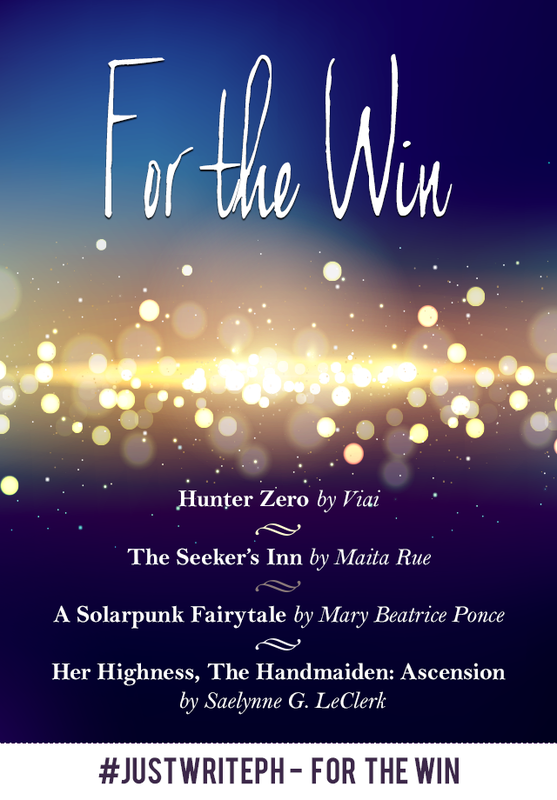 Again, you may buy the #ForTheWin bundle here, OR you may want to join their giveaway so you could win this bundle and enjoy all four stories absolutely FREE! Click this link to enter the giveaway. To see what other bloggers will be/have been saying about the #JustWritePH For the Feels bundle, click on this link.